Usually, drawing one's makeup on with a marker is highly discouraged (case in point: sharpied-on eyebrows), but this new felt tip liquid eyeliner has my inner coloring-book-loving child raging. Ardency Inn, a hip, New York-based, new-to-Sephora makeup brand, is coming out swinging with their Punker World's Baddest Eyeliner – a bold liquid liner with a pen-inspired design for maximum precision and control. 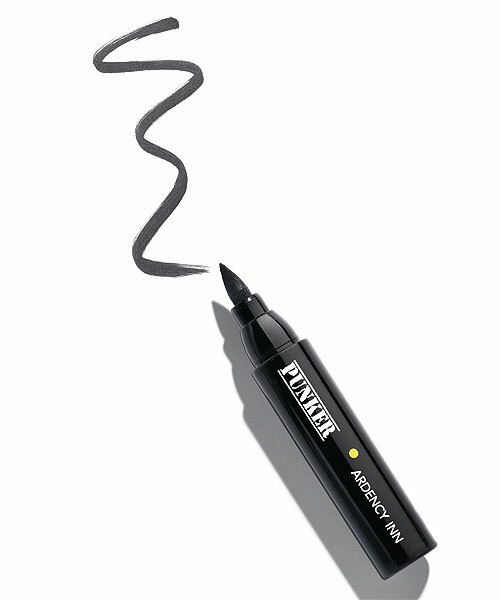 Perfect for the uncoordinated makeup lover who just can't seem to master liquid liner, no matter how many hours have been spent in front of the mirror with a stash of extra-strength makeup remover on hand, Punker's handy felt tip makes it infinitely easier to perfect that thick, punk-rock winged effect.